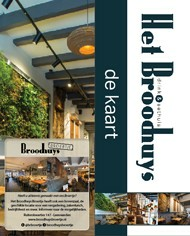 Het Broodhuys is the ideal location for a drink or a delicious lunch in the heart of Leeuwarden. We would love to welcome you inside or on our heated terrace. Special beers, take a look at the beer card. How about choosing Het Broodhuys as the venue for a party? We have room for about 200 people in our café and restaurant. If you also book our Huys catering, the location will be at your disposal free of charge. It’s not only delicious, it’s also very easy! We will of course discuss everything with you to make sure that we have enough original dishes and plenty of drinks to offer. Would you like more information or a free quotation? Het Broodhuys invests in the future and the environment. On the roof there are now 18 solar panels that provide an estimated annual yield of 4500kWh. Take a look at our other location.